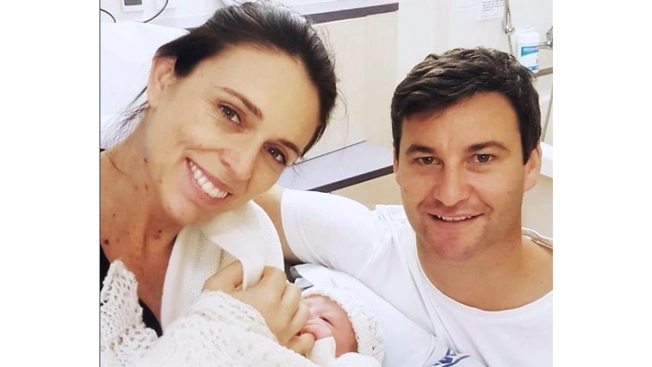 In this photo released by New Zealand Prime Minister Jacinda Ardern on Instagram, Thursday, June 21, 2018, Ardern and her partner Clarke Gayford pose with their newborn daughter at the Auckland City Hospital, Thursday, June 21, 2018, in Auckland, New Zealand. New Zealand Prime Minister Jacinda Ardern gave birth to a daughter Thursday and posted a message welcoming the healthy newborn "to our village." "Welcome to our village wee one," Ardern wrote in the caption on Instagram. "Feeling very lucky to have a healthy baby girl."